A recent McKinsey report notes that the intensity with which firms employ Information and Communication Technologies (ICT) depends on four factors: (1) size of the firm; (2) supply chain complexity; (3) skill levels inside the firm; and finally (4) threat of competition. Deployment of ICT facilitates reaches higher productivity levels inside the firm. The four determinants therefore seem reasonable as the firm-level literature shows that generally these four points are indeed factors that are strongly associated with greater firm performance. However, in my view, the second factor of supply chain complexity merits some elaboration and refinement, especially with regards to international trade. It seems intuitive at first sight to think that ICT tools and instruments smoothen the supply chain network. And so, the more complex this network becomes the more this chain uses ICT to solve complex hold-up problems related to trade. This is because ICT allows for geographically dispersed production and management activities. However, the data tells something different: some supply chain trade, which requires greater ICT, may actually be related to lower supply chain complexity. This can be seen by a measure that computes the “length” of the value chain by accounting for the number of production stages (Fally, 2012). The more stages of production involved, the lengthier the chain becomes, the more complex one can assume the supply chain is. The figure below plots the average of this indicator of supply chain complexity across a like-minded set of OECD economies for each sector on the vertical axis. The horizontal axis plots the ICT-intensity indicator from van der Marel et al (2016) to see for any meaningful pattern. Source: US BEA; OECD TiVA. Sector numbers follow ISIC Rev 3. 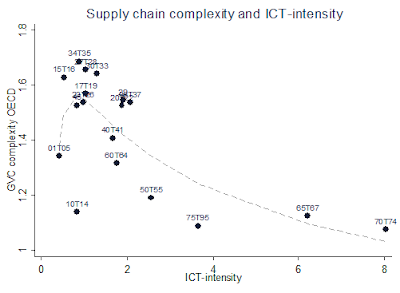 Interestingly, no positive relationship between supply chain complexity and ICT-intensity is observable, but a negative one! In large part, this is explained by the services sector. Services supply chains are known to be relatively shorter. 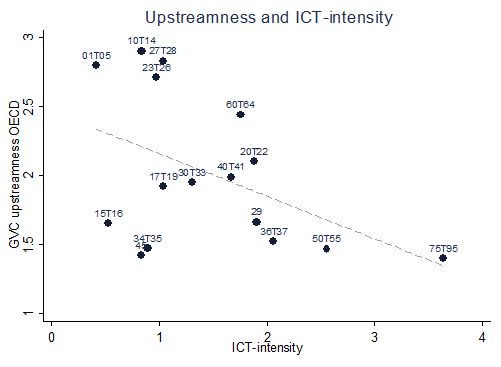 However, services supply chains also show greater levels of ICT usage as the dashed fitted values line shows (which is actually a two-way fractional-polynomial to show some subtleness in this relationship). Moreover, even across manufacturing supply chains little positive correlation can be observed in the upper left corner of the graph. In that corner of the graph, the fitted values line is upward sloping, but only because the agricultural sector is included. So, what then can improve explaining the increased usage and employment of ICT in the supply chain if not complexity, i.e. if not the second McKinsey point. Surely, ICT is being intensively used more in one part of the supply chain than in other parts. Indeed, some stages of the supply chain do use more ICT than other stages. 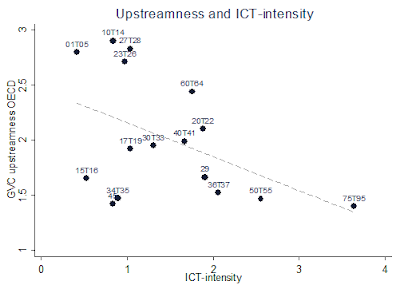 This can be seen in the following figure below which plots again the same ICT-intensity indicator on the horizontal axis but now using different supply chain indictor on the vertical axis, namely “upstreamness” from Antràs et al. (2012; 2018). Upstreamness means nothing else then “distance to final demand”. It indicates that when the level of upstreamness is higher the more a country or industry is specializing in the production of inputs at the beginning of the value chain. As such it can be expressed by country or industry. Lower upstreamness means that an industry is more downstream: it specializes relatively at the end of the value chain. The figure below sets out this measure on the vertical axis and shows that actually many services are very downstream, meaning that services supply chains are very close to final demand. Source: US BEA; Antràs et al. (2012). Finance and telecom are omitted because of being huge outliers. Sector numbers follow ISIC Rev 3. What’s more, the figure also shows that ICT-intensity relates much better with the supply chain position of an industry. Put differently, the extent to which industries are using ICT does not so much depend on the level of supply chain complexity, but is rather related to the extent to which industries are specializing upstream or downstream in the supply chain. Again, in great part this is related to services since more services are placed closer to the final consumer and at the same time are also more ICT-intense. That does not mean, however, that ICT tools may be more economically valuable for upstream suppliers, even though an industry or firm can be positioned relatively more downstream across the entire range of the supply chain. In all, complexity may not be exactly the right predictor for why firms use ICT in the supply chain and successfully export their goods and services, but rather their “place” of specialization in the supply chain. What that means for policy is for a next blog post. Antràs, P., T. Fally and R. Hillberry (2012) “Measuring the Upstreamness of Production and Trade Flows". American Economic Review Papers and Proceedings, Vo. 102, No. 3, pages 412-416. Antràs, P. and D. Chor (2018) “On the Measurement of Upstreamness and Downstreamness in Global Value Chains” NBER Working Paper No. 24185, National Bureau of Economic Research, Cambridge MA. Fally (2012) “Production Staging: Measurement and Facts”, University of Colorado-Boulder. van der Marel, E., H. Lee-Makiyama, M. Bauer and B. Verschelde (2016) "A Methodology to Estimate the Costs of Data Regulation", International Economics, Vol. 146, Issue 2, pages 12-39.